I'm back with some fun projects to share and tomorrow I will tell you all my exciting news....I cant wait! I peeled the pics off, sanded the bowl and painted it and this is how it looked for months until I decided what I wanted to do with it....boring huh? Until I discovered these foam stickers and for some reason thought that if I painted the bowl and when I removed the stickers it would be fab-u-lous!!!!!! Look what happened when I lifted the corner of the sticker..... Really - I should have realised with foam that some seepage would occur! I still like the original though - but a change is good ...right? You know, I like the bowl! It has a nicely rustic beachy feel! Fill it with sand! Yeah, I really like the new version too. 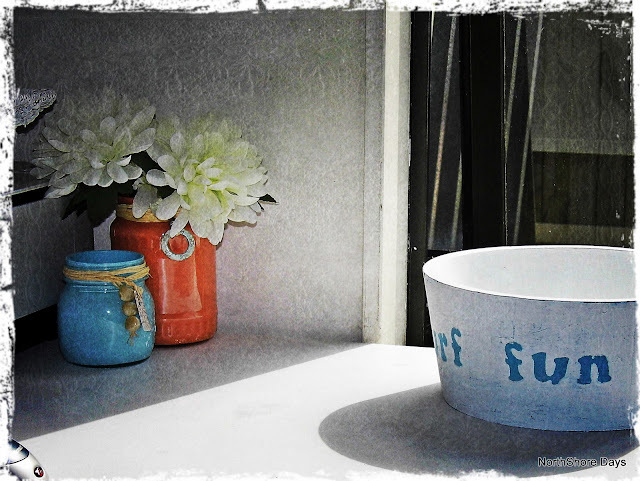 It's cute and fun like the word on the bowl ! Natalie, it's one of those bowls that makes you smile. It's so cute! Oh that looks really cute!! I love it, I love everything beachy!